This entry was posted in Food Glorious Food and tagged desserts, food, lemon rhubarb pie, pastry, recipe, seasonal, winter desserts, yogurt by cityhippyfarmgirl. Bookmark the permalink. Pie is certainly an easy way to eat the seasons isn’t it. You would have to muscle me out of the way as well, it looks wonderful. That is just like kiddies. You think that they will do one thing and then they totally throw your plans and do the opposite. It’s those damn educated palates I’ve created you see… must remember, less variety for them. They do… the cheeky things. I really was hoping it would be a little too tart for them, but no not even in a small pause on the first bite. Oh my, as we say in the South. That’s just pretty! Love it. 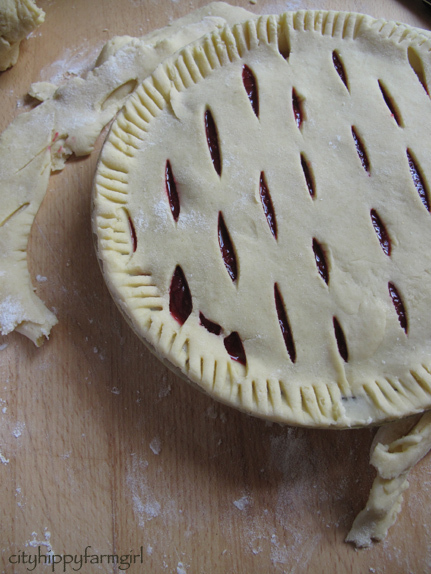 And the crust is beautiful. You are such a great food writer! I wanted to see a photo of it cut… a slice of the old tart, with some double cream to smooth her out! Thanks Dixiebelle. I think a little vanilla mascarpone on the side? A slice of that pie on that gorgeous rose plate would be very hard to resist…what a feast for all the senses! Gorgeous looking pie there, Brydie. Shame about the kids, though. I would have thought the competition for something not so sweet would have been limited. No unfortunately. They surprise me sometimes with what they will eat and what they won’t. Ooh, I love tart fruit dishes. Mum would never add sugar to fruit when I was growing up, a 100g in the rhubarb seems quite generous! It’s great when you cook something delicious and no one wants to share it. You are a genius! You are my hero! I have put rhubarb on my list and am making this for ME! and I love your pie! You know what Heidi, when I was typing this one out, I was thinking to myself, I wonder if Heidi would like this one? Pleased I didn’t disappoint! That’s very interesting – I have a taste for bitter things, but with me, it was an acquired taste, not well developed until late adulthood – I think it’s unusual for kids to like bitter things. Do they like yogurt too? dear brydie, since i can’t find rhubarb in my greek island’s local market, may i use an alternative ingredient (i.e some summer fruit, or jam preserve, maybe of any kind of berries)? i understand that this differentiate the version of your recipe, however i welcome any kind suggestion of yours on my request above! Gina, I think a whole lot of other seasonal produce would work just as well for this pie. Coming to mind, would be plums or what ever berries you had available. Go wild! Lucky thing! I love it when people are generous with their citrus goodies. Ooh. Now I’ve actually made pie (!) I can appreciate this recipe even more. I would imagine that the lemon would work brilliantly with rhubarb. I’m also very impressed with the look of your pie. It looks superby professional! It’s the old stretchy pastry trick Kari. 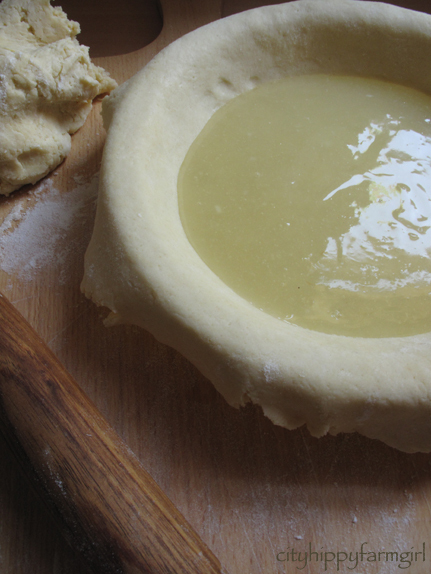 Try it for your next pie. dead easy. It’s not for everyone, but those that is, I think deserve two slices. 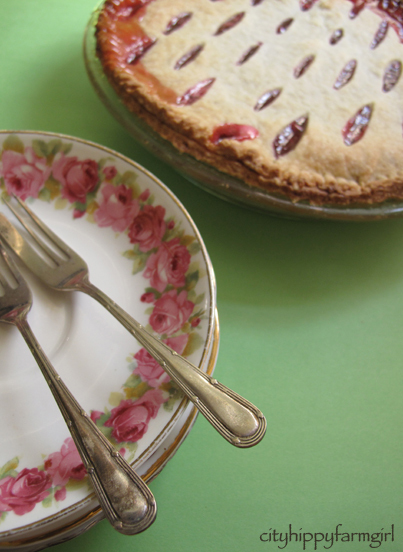 Your tart really looks fabulous but I just cannot get to like rhubarb and it is not for lack of effort – I really have tried. Swap it for berries or plums perhaps? 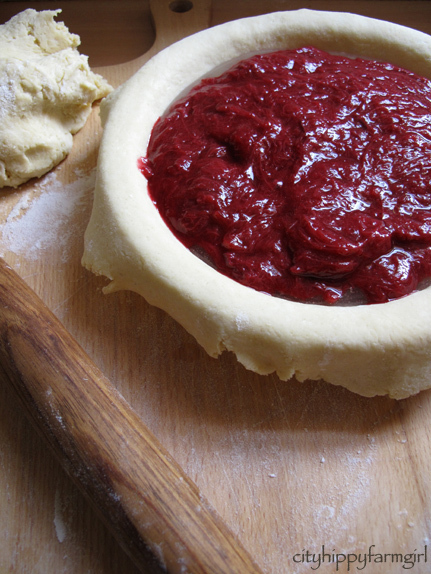 I intend to be ‘accidentally in the neighbourhood’ when next you make this pie. Delectable. You know The Monkeys will wrestle you for it. Happily. Funny, I had hopped over to yours after Multiple Mum too, but got side tracked and didn’t get time to comment, vowing to come back! Glad you liked the Tasmanian posts, there were also a couple back in January that might interest you as well. Hope the move goes well. Wow, never thought of combining rhubarb and lemon before, but sounds like an inspired combo. I love the way you’ve layered it, I must try that some time. The layers didn’t stay so much once it was cooked. Maybe if you cooked the base blind beforehand, then layed it and then just cooked the top, the layers would stay more. I think the lemon mixture got too hot though and a lot infused with the rhubarb. Oh God. Saving this one as well. I just planted my first rhubarb a few weeks ago and it’s so strong and happy. Now I will look at it with lust and desire. The little tart. Well it’s not a true tart unless it’s tarty – you’re training those monkey boys up well.